Do you recognize the lines above? They come from Sonnets from the Portuguese (this is 43) by Elizabeth Barrett Browning. The sonnet is a fourteen-line lyric poem that originated in Italy and slowly made its way across Europe and to England. Sonnets were first written as love poems. The type of sonnet, Petrarchan (Italian) or Shakespearean (English) generally determines the structure and rhyme scheme. Before we get into the "rules" and specifics, let's start with a some words about the sonnet. chapter two was about the sonnet. about everything. I'm not that lame. to do what I used to do. Again. Even if it means getting called out on strikes. Sorry, Will, the sonnet's not for me. Baseball's my love—not some thou or thee. to write that, and it isn't very good. skinny and sick but I'm not a quitter. than I thought I could. Poems ©Ron Koertge. All rights reserved. These two poems are from Shakespeare Bats Cleanup by Ron Koertge. Kevin Boland (known to his baseball-playing buddies as Shakespeare) is sidelined by mono and must spend time at home resting and recuperating. What's a boy to do when he's told he's sick and can't play the sport he loves? His father, who is a writer, hands him a marble composition notebook and says, "You're gonna have a lot of time on your/hands. Maybe you'll feel like writing/something down." Soon after this Kevin takes a book about poetry from the den and secrets it away to his room. As Kevin recovers from mono he writes about the death of his mother, girls, baseball, the past, and the struggles of a typical teenager. The poems take a variety of forms, including sonnet, couplet, free verse, elegy, pastoral, pantoum, and more. One of the things I love about this book is Kevin's perspective on writing and poetic forms, particularly the sonnet. The transition from octave to sestet usually contains a turn. The English sonnet is composed of three quatrains and a final couplet. The turn in this version comes with the final couplet. The poems in this crown are not easy to read. They are unsettling, shocking, and sad, but this is an important event in the history of our nation that needs to be told again and again. The book ends with a short biography of Emmett Till, extensive notes on the 15 sonnets, and an artist's note. The tempera illustrations by Philippe Lardy quietly reflect the themes and moods of the sonnets. One of the sonnets in this crown is written from the perspective of the tree witnessing the lynching, and echoes some of the sentiments expressed in Paul Laurence Dunbar's poem The Haunted Oak. Poem ©Marilyn Nelson. All rights reserved. You can listen to an interview with Marilyn Nelson on NPR and hear her read the entire poem. If you are interested in using this book in he classroom, you can download a teacher's guide from Houghton Mifflin. 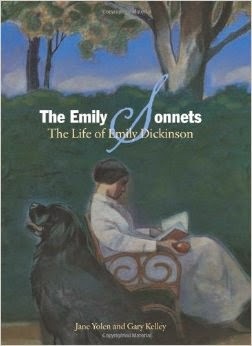 The Emily Sonnets: The Life of Emily Dickinson (2012), written by Jane Yolen and illustrated by Gary Kelley, is a sequence of sonnets that together tell the story of Dickinson's life. Written in the voices of Dickinson, her dog, sister, and others, each poem lovingly points back to the words used in Dickinson's own works. Back matter includes detailed information about the context of the poems and includes interesting and endearing anecdotes to accompany each sonnet. Here are Yolen's words from the Author's note about the collection. In this book of sonnets about Emily's life, I have given each poem a title and an indication as to the speaker, whether Emily herself, her sister Lavinia (Vinnie), her niece Martha (Mattie), her mentor/friend Thomas Wenworth Higginson, an unknown critic, or me (JY). I have tried to tell the truth of her life, but as Emily said: "Tell all the Truth but tell it slant—/Success in Circuit lies ..."
Except the one that bore me. The roof was slant, the walls quite thick. My mother did not adore me. A grimace more than joy. The first one was a boy. From drowning in that icy wave. Poem ©Jane Yolen. All rights reserved. It's rare to find sonnets in poetry for children, so I have one more title to recommend. 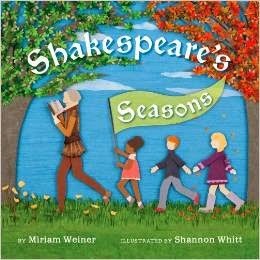 Shakespeare's Seasons (2012), created by Miriam Weiner and illustrated by Shannon Whitt, is an introduction to Shakespeare that combines snippets of his verse (mostly sonnets) accompanied by illustrations that span the seasons of the year. Back matter includes a short note about Shakespeare and his work. Here is an excerpt. The way people speak to each other has changed a bit since Shakespeare's time. This is why some of the words in this book—words from his sonnets and plays—may sound funny to you. But listen carefully and you can enjoy the music of his words, and the pictures they create in your mind. The book opens with the season of summer and these lines. Most excerpts shared are four lines or less, though the longest quote is eight lines. Shakespeare's words, paired with Whitt's lovely images, make the language and ideas easily accessible for children. If you haven't seen this title, take a quick look at the images from the book at Shannon Whitt's web site. If you are ready to tackle reading and/or writing the sonnet with your students, here are some helpful resources. The Poetry Foundation has a terrific article on the form entitled Learning the Sonnet. Kelly Fineman has written a terrific post entitled Sonnets (no, not from the Portuguese) that provides a great deal of information on the form. Shakespeare Online has a helpful page on iambic pentameter and the English sonnet style. Poetry Through the Ages has a page on sonnets that describes many variations. The PBS program In Search of Shakespeare has a nice lesson plan on the sonnet. The Iambic Pentameter web site has a wealth of information on this meter. KidZone has a nice template for writing a sonnet. Even though written for high school, the Composing Sonnets pages have useful information for studying the form. 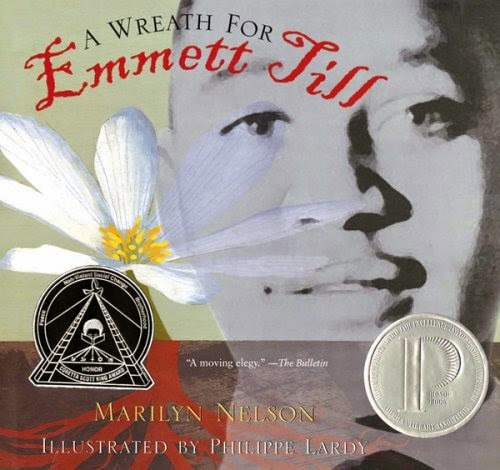 Teaching Tolerance has a poetry lesson plan for use with the Marilyn Nelson's book. That's it for the sonnet. I'll be back tomorrow with another form.